Tasting glasses: A sound investment, or a waste of money? Is it too late to still be wishing people Happy New Year? Like, is there an expiry date on when you’re still allowed to ask: ‘How was your Christmas?’ Well, I’m going to jump in and wish you all a Happy New Year anyway, and I hope you all had a banging Christmas. Mine was top, and filled with the usual family, friends, too much food and this year, of course, a generous measure of Scotch. A generous measure of Scotch that I enjoyed sipping from the set of Glencairn glasses I unwrapped on Christmas morning. Now, if I’m being straight with you I hadn’t given much thought to investing in any additional whisky glasses besides the tumblers I already have. As far as I was concerned, for sipping whisky at home the tumblers were just what I needed – no fuss, no nonsense, easy drinking. And isn’t it all about the liquid? Does it really matter what kind of glass I’m drinking it from? I just didn’t think tasting glasses were that important... but let me tell you fam, for those times that you really want to be able to nose, sip and savour your whisky properly, those glasses are a game changer. If you’re a new whisky drinker like me and you’re sat there rolling your eyes like I admittedly once did, hold up a minute; let me explain. 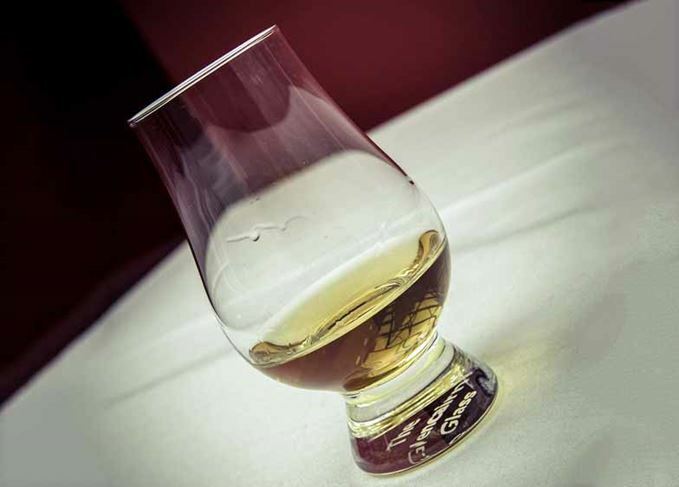 You’ve got your Glencairn glass, right? The bottom feels solid and weighted, often made from slightly thicker glass – great for if you’re a bit clumsy like me and would rather not be breaking things in front of your mates. Then you’ve got the bowl-shaped base that allows you to swirl the whisky slightly – which, as I recently discovered, is often used to help open the aromas of the whisky even more. Then there’s the narrower, tapered rim of the glass that’s designed in such a way to capture the aromas of the nose, but don’t sweat it – it doesn’t compromise on ease of drinking (very important). So all-in-all, you’ve got a pretty perfect creation with which to enjoy your dram. But then I started looking into this a bit further and found that there’s pretty much a tasting glass to suit your every need. Let me give you an example: the copita-style glass, shaped like a tulip with a long stem, kind of like a mini-Champagne flute, if you like. Apparently the long stem is supposed to prevent the smell of the drinker’s hand from interfering with the aromas... or you could just, you know, wash your hands? Each to their own, I guess, but like the Glencairn glass the copita has a wide bowl-shaped bottom and narrow rim to concentrate aromas. Then you’ve got the snifter, which is shaped like a brandy or Cognac glass, the kind you probably associate with after-dinner drinks in old-fashioned smoking rooms. Though I’m told the extra-wide base and even narrower rim (compared to the other two glasses) can cause some of the harsher aromas to come through – not really what you want if you’re looking to really get into the depth and complexity of the whisky. But it looks proper classy, you have to admit. So, am I going to do away with my trusty tumblers in favour of the Glencairns? Nah, mate. As I said, those tumblers are just what I need to simply enjoy a dram. But for the times when I want to train my nosing and tasting abilities a bit, and explore whisky in a little more depth, you can bet I’ll be reaching for the Glencairn. Are whisky tasting glasses worth the investment? Absolutely bruv.